I first heard Royal Thunder when they opened for The Sword a couple of years back, and they performed very, very well. The band played a strong mix of blues and southern influenced hard rock, but I was most impressed with Mlny’s raspy, howling, emotive voice which reminded me of Stevie Nicks, Melissa Etheridge and Joan Jett. Within a few days of the show I bought CROOKED DOORS and CVI, and while I do like both albums, and the highs are high (“Ears on the Fool” and “Time Machine,” for example), the biggest issue overall is consistency. The first two albums showed a great degree of potential, so I came into this album interested in seeing how they grew as a band. WICK starts with a song called “Burning Tree” that has a middle-eastern melody hypnotically running throughout. I am not a fan of the warbling vocal effects used in a couple parts of the song, but I do appreciate how the band is experimenting in their songwriting and feel the band was deliberate with the placement of this song in order to let the listener know that he or she is in for a different experience than the previous albums. The following song, “April Showers,” is the strongest on the album (a link to the video is provided below). Strong, sultry, and bluesy with a brooding buildup that grows from contemplative to explosive. This song best exemplifies the strengths of the band. The next few songs are also strong, and shows the talent of the band in its songwriting diversity. The best being “We Slipped” an up-tempo rocker, “The Sinking Chair” the heaviest, fastest, and most furious on the album, “Plans” dials back the heaviness, but remains weighty with emotion that you can feel in Mlny’s voice, and “Anchor” a mid-tempo song that has a catchy melody throughout showcasing the talents of every member in the band. Then the last 40% of the album loses some steam. I rather do like parts of “Push,” “Turnaround,” and “The Well,” but their feel is too similar to earlier songs and they do not end up being particularly memorable. “WICK” and “We Never Fell Asleep” are the two songs I do not care for as they sound like the band is trying to jam too many ideas into each and they lose coherency as a result. With this album it is apparent the band is trying new things, and while not all of them succeeded, the effort is appreciated and applauded. Far too many bands fall into a formula and grow dull on subsequent albums. 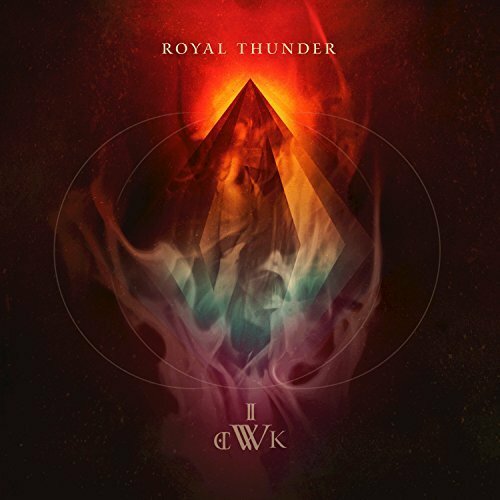 Royal Thunder have leveled up and I am looking forward to the next step in their progression.